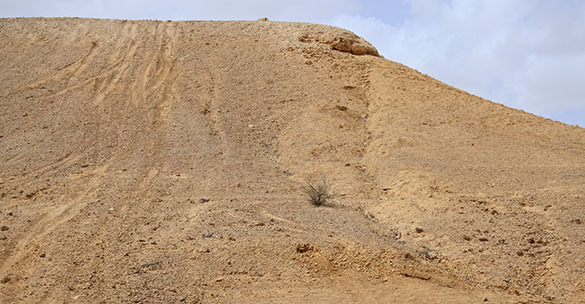 MITZPE RAMON, ISRAEL — It was another very windy day in southern Israel, but still just fine for fieldwork. 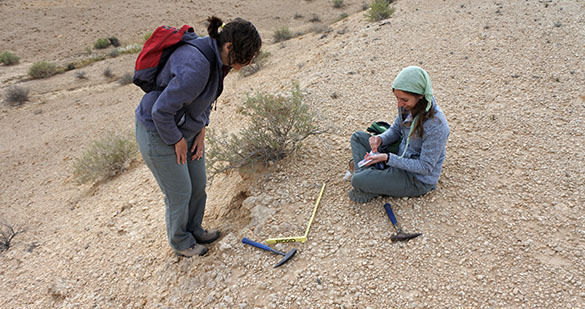 Yael Edelman-Furstenburg, Yael Leshno and I returned to Makhtesh Gadol to work on Yael Leshno’s data collection procedures for her PhD project in the Middle Jurassic sequence here. Our first task was figuring out the detailed stratigraphy, which is not especially easy considering all the faulting and somewhat dated lithological descriptions for orientation. 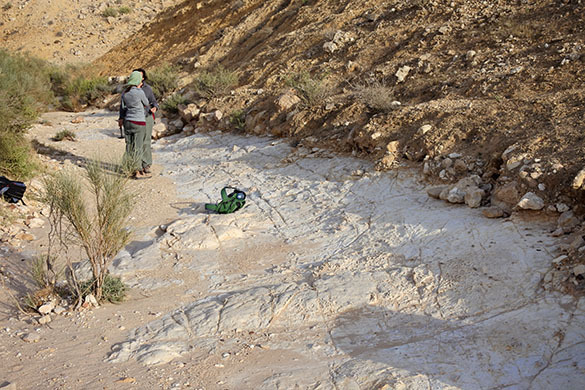 The above image is of the Zohar Formation just below its contact with the Kidod Formation (depending on what stratigraphic scheme you follow!). The top few meters of the Zohar Formation are a series of argillaceous limestones with numerous trace fossils (Planolites and Thalassinoides, mainly) and this gorgeous erosion surface (disconformity). The white limestone beneath was lithified when it was exposed and downcut by sand-bearing currents. 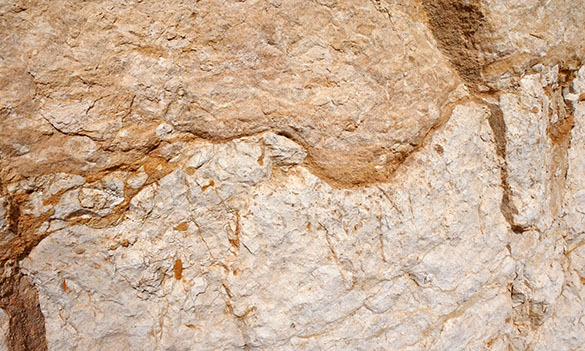 On the left you can see pieces of the limestone incorporated into the overlying calcareous sandstone. Classic. We then moved up section into the Kidod Formation (or upper Zohar!) to the site of the first stratigraphic column constructed through these rocks. Right of center you can see a trench dug into the marls by Moshe Goldberg in 1962. This was part of his project to describe the entire Jurassic section in Makhtesh Gadol. We still use his iconic work today as “Goldberg, 1963”. Here are the Yaels starting the very first quadrat measurements within the Matmor Formation. Within a half-meter square they are counting and identifying all the fossils — every little bit over a few millimeters. Student Yael has many of these quadrats in her future! Here is a view of the Makhtesh with the Yaels at work. You can see our white field vehicle from the Geological Survey in the middle distance. We ended the day at this bedding plane in the upper Matmor Formation I remembered finding many years ago. It has spectacular clam and gastropod fossils across its surface, many in apparent life positions. I’d show you images of the critters, but I’m saving them for a Fossil of the Week post!